The octogenarian former US secretary of state, who presided over the 1999 bombing of Yugoslavia, and infamously insisted that the US sanctions against Iraq which led to the deaths of half a million Iraqi children were "worth it," has come back into the limelight with a new warning to the world. In an op-ed for the New York Times, Albright warned that today, "fascism – and the tendencies that lead to fascism – pose a more serious threat now than at any time since the end of World War II." 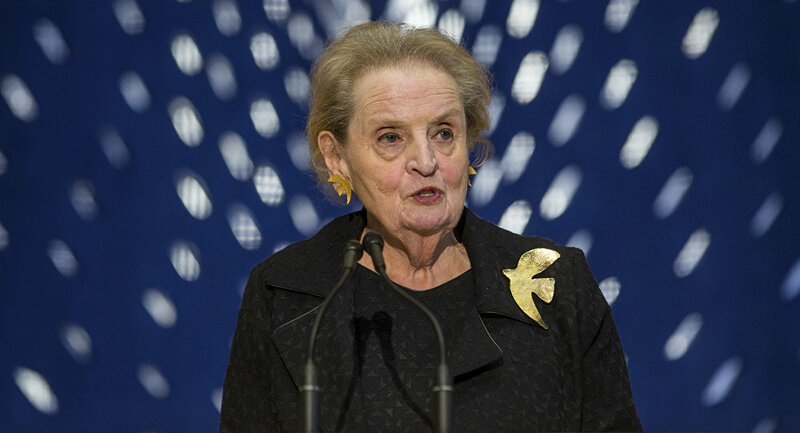 According to Albright, the Trump presidency's volatility and retreat from global leadership have given fascism "a fresh chance to strut around the world stage," with countries including Hungary, Poland, Turkey, and even Germany facing the growth of "nativist movements," while Russian, Chinese, Venezuelan, Iranian, and Syrian "despotism" threaten freedom. "If freedom is to prevail over the many challenges to it, American leadership is urgently required. This was among the indelible lessons of the 20th century," Albright stressed. Unfortunately, she lamented, President Trump has instead "steadily diminished America's positive clout in global counsels." The op-ed has sparked an intense online debate, with Trump opponents praising the former secretary of state, while those with longer memories thought back on some of Albright's less spectacular moments. Sputnik recalls a few. In 1996, Albright was famously asked by CBS journalist Lesley Stahl whether the price of the estimated 500,000 children who died as a result of US-backed UN sanctions against Iraq were worth it. Albright's reply was: "I think this is a very hard choice. But we think the price is worth it." Facing a public backlash following the interview, the diplomat calling the segment "Iraqi propaganda," and accused Stahl of asking her a loaded question. In 1998, asked about a possible US military intervention in Iraq, Albright famously remarked that while Washington would try to stay on the diplomatic track, "if we have to use force, it is because we are America; we are the indispensable nation. We stand tall and we see further than other countries into the future, and we see the danger here to all of us." Albright's famous term was later picked up and used by other US officials, including President Obama. One of the Clinton administration's most ardent proponents of the 1999 NATO bombing of Yugoslavia, Secretary of State Albright made a televised appeal directly to the Yugoslav people, insisting that the "international peace forces led by NATO would protect both Serbian and Albanian civilians," and promising that "Kosovo would remain as an integral part of Serbia." The 78-day NATO bombing campaign led to upwards of 5,700 civilian deaths, and contaminated large areas of Kosovo, central Serbia and Montenegro with radiation from NATO's depleted uranium munitions. Nine years later, Kosovo declared independence from Serbia, with Serbs living in the region and even Serbian officials regularly subjected to discrimination and attacks. In 2012, during a book signing at a Prague bookstore, Czech activists confronted the former secretary of state over the Kosovo War, to which an agitated Albright shouted "Disgusting Serbs, get out!" Finally, in 2016, Albright made headlines at a campaign event in support of Hillary Clinton against Democratic primary opponent Bernie Sanders, saying "There's a special place in hell for women who don't help each other!" In addition to her insensitive, untruthful or just plain hateful commentary, Albright is also known for promoting or supporting some of the Clinton and Bush administrations' most controversial decisions, from blocking more decisive UN action during the 1994 Rwanda genocide, to funneling billions to right-wing paramilitary organizations in Colombia, to supporting President George W. Bush over his decision to invade Iraq in 2003.